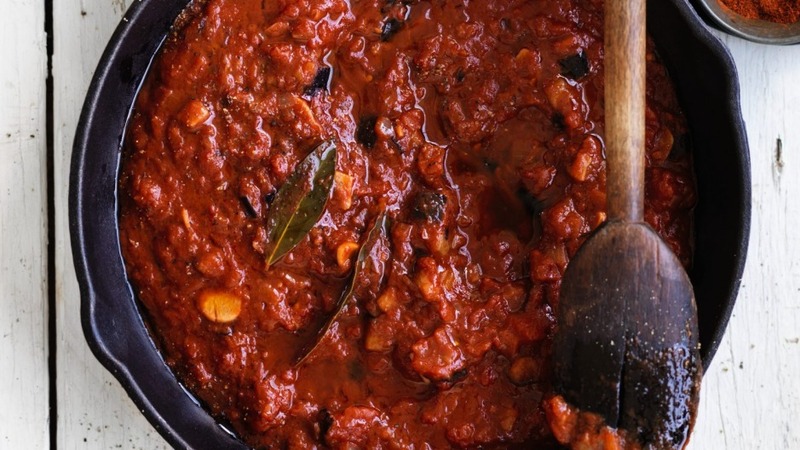 Rich and delicious, this is a great standby simple pasta sauce. I like to thicken it slightly, just before I add the wine, by dusting the flour shaker over it. You only want a teaspoon or so of flour, stirred in immediately and quickly to avoid lumps, but this cooks down to a silky texture without any floury aftertaste and stops it separating when you serve it. Serve with your favourite pasta. 1. Heat 75 millilitres of olive oil in a large frying pan, then add the eggplant, sprinkle over one teaspoon of salt, then fry over a high heat until golden on all sides. Spoon the eggplant onto a plate. 2. Add the remaining 25 millilitres of olive oil to the pan, then add the onion, garlic, remaining salt and 200 millilitres of water. Boil until the water evaporates and the onion starts to turn golden, then add the tomatoes and bay leaves and boil on a high heat for about 15 to 25 minutes until the juice evaporates to a thick sauce. 3. Stir in the vinegar, wine, tomato paste, sugar and cayenne pepper and simmer for five to 10 minutes until thick again. Add the eggplant, stir well and check the seasoning, then heat until boiling to serve. The sauce keeps well in the fridge for a few days or up to three months in the freezer.